Jim Thorpe--About the FilmJim Thorpe, The World’s Greatest Athlete is a biography of the Native American athlete who became a sports icon in the first half of the 20th century. Beginning with Thorpe’s boyhood in Indian Territory it chronicles his rise to athletic stardom at the Carlisle Indian Industrial School, winning two gold medals at the 1912 Summer Olympics, his fall from grace in the eyes of the amateur athletic establishment, and his rebound in professional baseball and football. Thorpe retired from pro sports at age 41 just before the stock market crash of ’29. He worked as a construction laborer before getting work in Hollywood as a bit part player. He became a representative for Indian extras in Hollywood, fighting for equal pay for Native Americans in the movies. In the 1940s he crisscrossed the nation as a public speaker advocating for Indian self-determination. This is a film about a man who used his amazing physical prowess as a way to affirm his American Indian identity in the face of unrelenting efforts to eradicate Native American culture. It is the first documentary film to tell the story of Thorpe’s life outside of his well-known athletic victories.The film uses in-depth interviews with Thorpe’s surviving children, some simple recreations and images culled from over seventy-five archive sources, both stills and motion picture. Presented by Native American Public Television, the film will air on U.S. public television stations in fall 2009 and winter 2010. Comment: The summary pretty much sums it up. The documentary is a bit on the glowing side; it begins with the omnipresent flute music and glosses over Thorpe's drinking and spendthrift ways. But Jim Thorpe is a solid look at the athlete's life. He played against Dwight Eisenhower in the Army-Carlisle football game. He spoke out for Indian land rights and oil royalties. He was an extra in Errol Flynn's They Died with Their Boots On, one of the few Westerns in which Indians won. He later punched Flynn in a bar after Flynn taunted him. 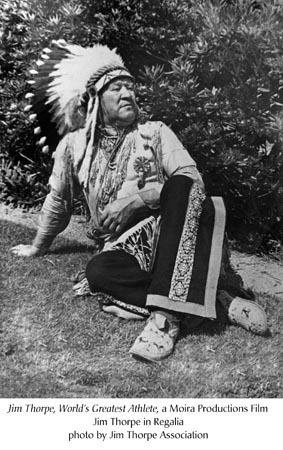 He lectured in a stereotypical Plains chief outfit under the name "Bright Path." The movie doesn't mention Jim Thorpe, Pennsylvania, or the controversy over Thorpe's burial place. That may be for the best. Rob's rating: 8.0 of 10. Check it out if you get the chance. For more on Thorpe, see Three Native Olympic Gold Medalists and The NFL's Oorang Indians. I still liked the Burt Lancaster film and portrayal in "JIM THORPE ALL AMERICAN" - 1951, even though he (Lancaster) is non-native, the film doesn't paint a myth, it shows all the struggles Thorpe went through. I liked Burt Lancaster in another film where he struggles, but manages to speak Kiowa, "The Scalphunters" 1968 is a Sydney Pollack film that is close, but not nearly as native as "Little Big Man" was to a comedy-western. It unfortunately uses an Italian as the leading Kiowa warrior role, but the rest of the cast is great with Telly Savalas as the villian, Shelley Winters as his mistress, Ossie Davis as a runaway slave "adopted by the Comanches, and a young Dabney Coleman as one of the scalphunters. I'd like to see this documentary on Thorpe. I have a Jim Thorpe post coming in my blog; I keep forgetting to do it.